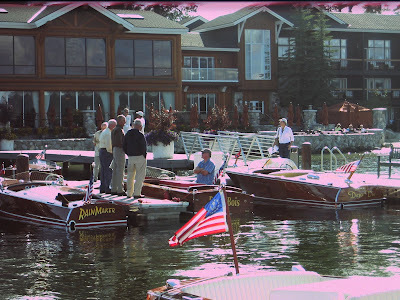 Live-ish From Idaho… No Taters, Just Cool Classic Boats. 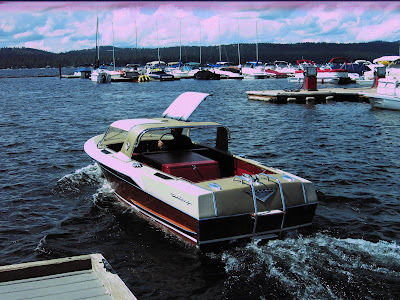 Roving Woody Boater Texx is at it again, this time at The Payette Lake 2009 Antique & Classic Boat Show. These Two Shots are from the hotel website… Not the show.. just in case you thought the show was in the late 50’s… Or Texx had gone back in time… mmmmmmm? Maybe another time… Now on with the show! 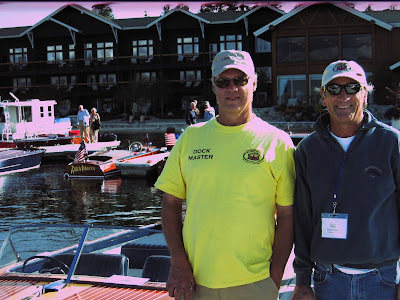 Payette Lake Chapter President / Dockmaster Jim Winslow and his team of volunteer’s worked long and hard to once again make this show a success. 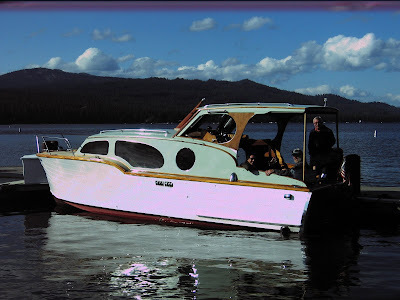 Jim Winslow is also the owner of Classic Boat Sales and Restoration in McCall, Idaho for over 20 years. Along side Jim is Trey Knipe, the owner of “RAINMAKER”. 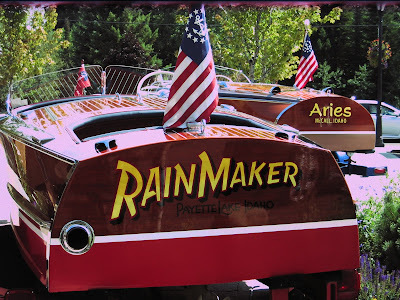 Prior to the show the chapter organized a great land display along the highway which included “RAINMAKER” a 1949 Chris-Craft Racing Runabout and “ARIES” a 1941 19′ Chris-Craft Custom Barrel Back owned by Rich and Mary Hormaechea. 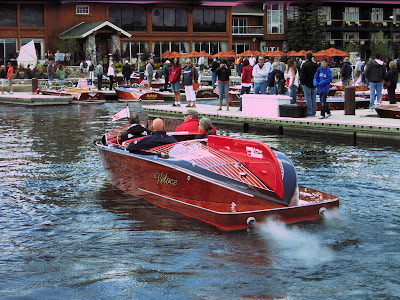 Don Hardy (the Owner of McCall Boatworks) included “MISS PAYETTE” a 2001 Garwood Replica Speedster 16′ with the land display. 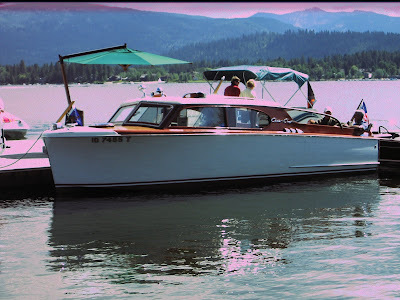 After a long winter of storage, Rex Lytle had to shake the cobweb’s off his beautiful 1961 Chris-Craft Continental. Once they got her started, she ran great all weekend. 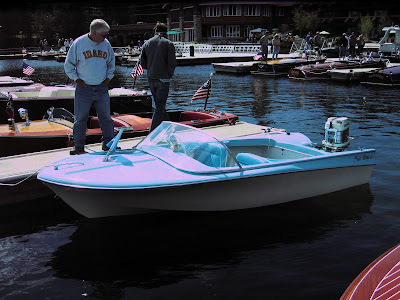 According to the locals, the marina in McCall (just across the lake from the lodge) was a long time Century Dealer going back as far as the 1940’s, which may be why 12 of the 40 boats at this year’s show were Century’s. A great example of an early Wooden Century is this 1952 18′ Sea Maid “UNCLE FESTER” owned by Tom Barton. A great original 1966 Century Sabre “007”. “VELOCE” made a rare appearance at this year’s show. 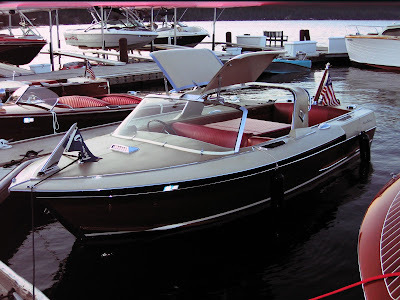 The 1948 23.5 ft Ventnor Custom Deluxe has twin Grey Marine Fireball 6’s and is always a crowd pleaser. 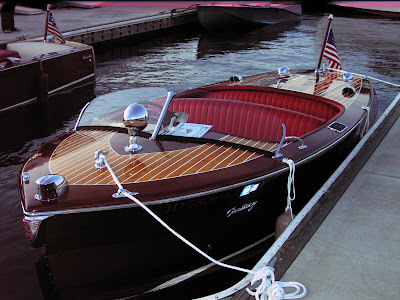 She was originally manufactured in Ventnor, New Jersey and later restored by the Resort Boat Shop in Post Falls, Idaho. 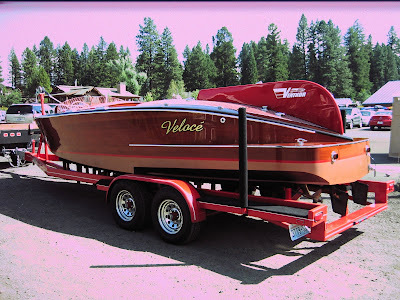 “JEFE” is a 2009 34′ CDA Resort Boat Shop Custom owned by Jerry Gilbreath, powered by twin 400 HP V8’s. 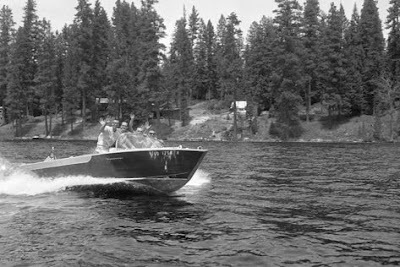 The Holm – Watson Families brought down their 1947 Chris-Craft Super Deluxe Enclosed Cruiser for the weekend. “PANACEA” is a 1948 Western Fairliner Cruiser and is one of the last plank hulled boats produced by the Western Fairliner Boat Company in Tacoma, Washington. 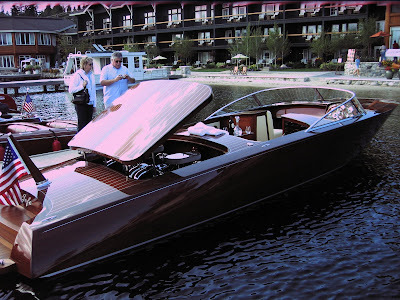 She was transported from the Puget Sound to Payette Lake in 2006 by her current owner’s, Scott & Sandie – Eric & Lori Anderson. 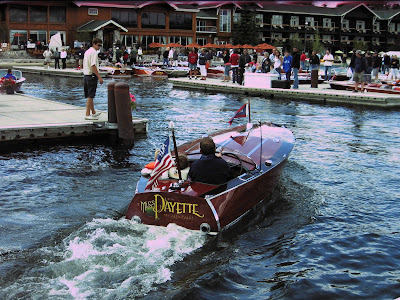 “MISS PAYETTE” returning from the Saturday afternoon boat parade with a few young woody boaters on board. 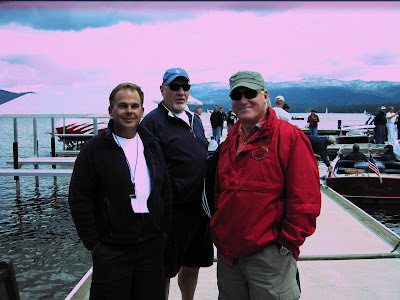 BK Powell, Past President of the Inland Empire Chapter (right)and Dana Gauston (center) made the trip down from Northern Idaho to attend the show, on the dock visiting with Don Hardy. Don Hardy and his wife Molly are very involved with the local ACBS Chapter and were busy helping out with the boat show throughout the weekend. These local boat shows are fun to attend, lots of great stories, lots of great people, and of course lots of beautiful boats. The End Of The Earth Is May 21st, Ahh Crap, That's This Weekend. .
Thankyou Texx and Woodyboater. Fun to see, difficult to be an attendee. Very nice report, Texx, Thanks for the great photos and comments. It's espceially good to see that some folks were at a cool boat show on a cool lake and on a cool August day. Jackets in August? Cool! Great stuff texx! Looks like you and MOST of the attendees had an absolutly wonderful time. 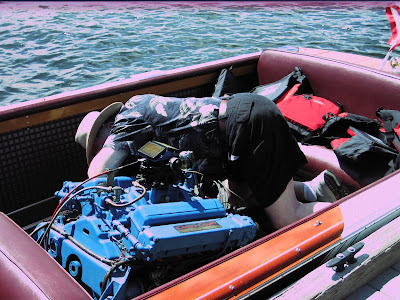 This is the greatest venue a wood boat owner can find in the northwest and is extreamly well orchastrated from start to finish! 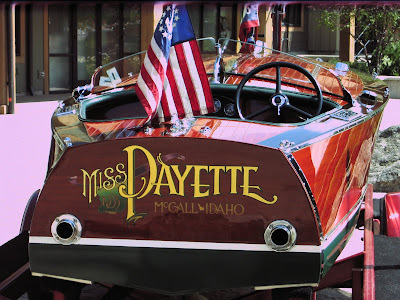 The Payette Lakes Chapter is really looking forward to hosting a regional show in 2011 – hope woodyboater will come again and bring all your friends! 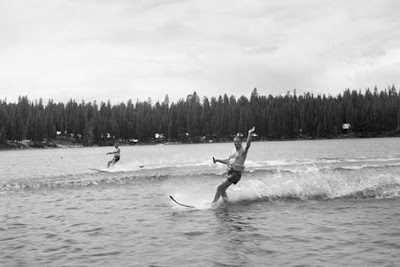 The 1948 23′ Ventnor in this article… I believe this is one that was on our lake (Conneaut Lake, PA)… Originally purchase by Guy & Mary Gully of Ferrell, PA. 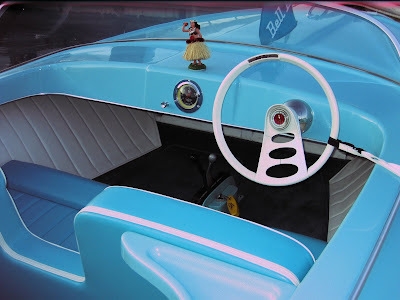 The Gullys Had a number of cool boats over the years..